Did you know that February 28th is National Pancake Day? 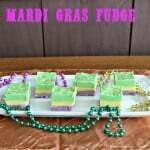 It’s also Mardi Gras so I decided to combine both celebrations into one delicious dish! 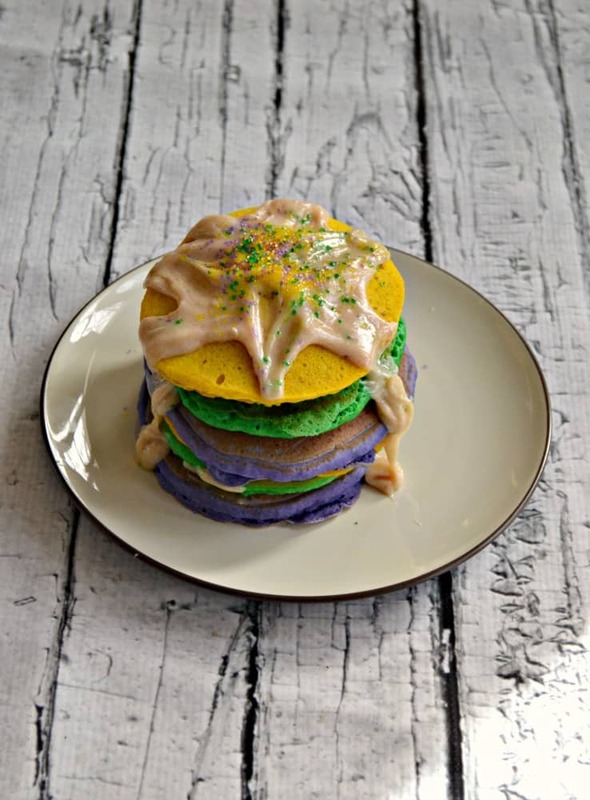 I made these super fun King Cake Pancakes. They were easy to make and would be great for breakfast, brunch, or even dessert. I started with Krusteaz Buttermilk Pancake mix. I love this mix because all you need to add to it is water. There’s no messing around with milk or butter or eggs. It’s all in the mix so this is the perfect pancake mix for a quick and easy breakfast. Now because I was making King Cake Pancakes I did add some vanilla and cinnamon to the batter. When I think of King Cake I think cinnamon and spice. So I mixed the buttermilk pancake mix with the cinnamon and that was it! 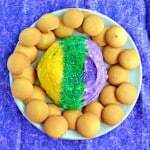 Then I divided it into three bowls and colored one yellow, one green, and one purple which are the colors of Mardi Gras. The next thing you need for great pancakes is a great pan. I used my T-fal Thero-Spot Non-Stick Fry Pan. I actually have several T-fal Non-stick pans. I like the size of them and I like the non-stick surface. It helps limit the amount of fat I have to put in the pan when I’m cooking. It also gives an even cook to whatever I’m making. The T-fal Thermo-Spot is a unique heat indicator that shows when the pan is ready to use and helps to prevent burning. It’s non-stick inside and out for easy cooking and cleaning. It’s great for cooking pancakes because I don’t like to use oil or butter in my pan when cooking pancakes and they didn’t stick at all to this pan. I poured the colored pancakes into the pan and they baked up quickly. It took about 2 minutes on the first side and 1 minute on the second side. I had all 6 pancakes out in under 10 minutes. They were fluffy and looked delicious. I set them aside while I whipped up a quick Cinnamon Cream Cheese drizzle. To finish my King Cake Pancakes I layered them on a plate with a bit of the drizzle in between each pancake. Then I put the rest of the cream cheese drizzle on top of the pancakes and sprinkled them with gold, green, and purple sprinkles. These are such fun pancakes. They were super fluffy, had great texture, and tasted lightly of cinnamon. 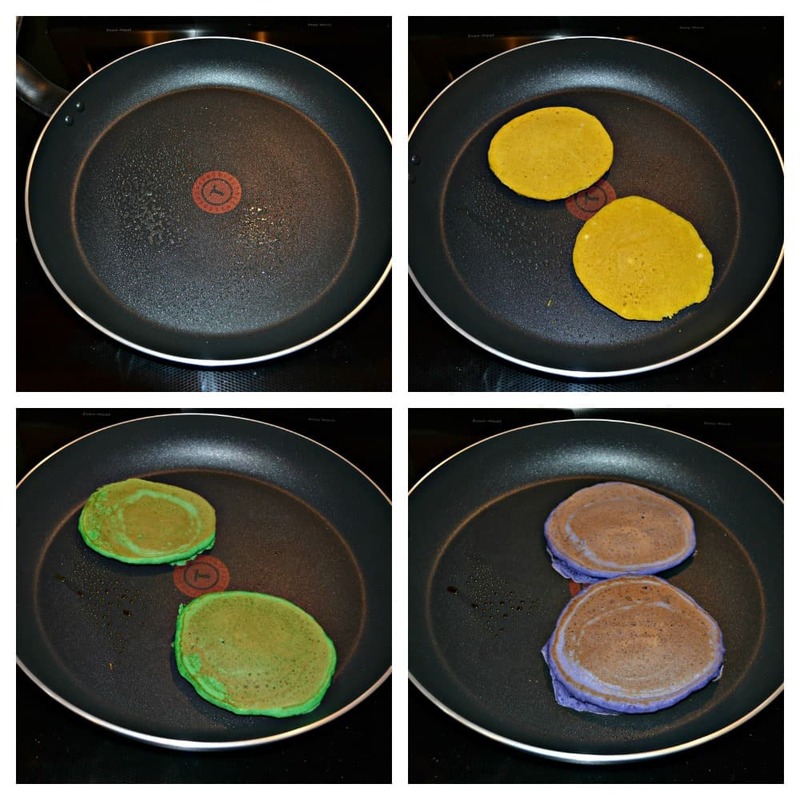 Kids will love the colors in these pancakes. Then the cream cheese drizzle adds sweetness to the pancakes. 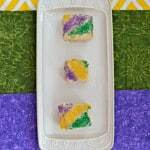 It’s a fun and festive breakfast or dessert perfect for Mardi Gras. 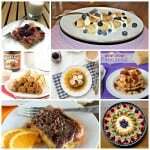 Want to make these tasty pancakes for National Pancake Day and Mardi Gras? Head to your local Target and pick up the Krusteaz Buttermilk Pancake Mix. Then get 15% off select T-fal non-stick cookware at the store or Target.com from February 27th through March 3rd! 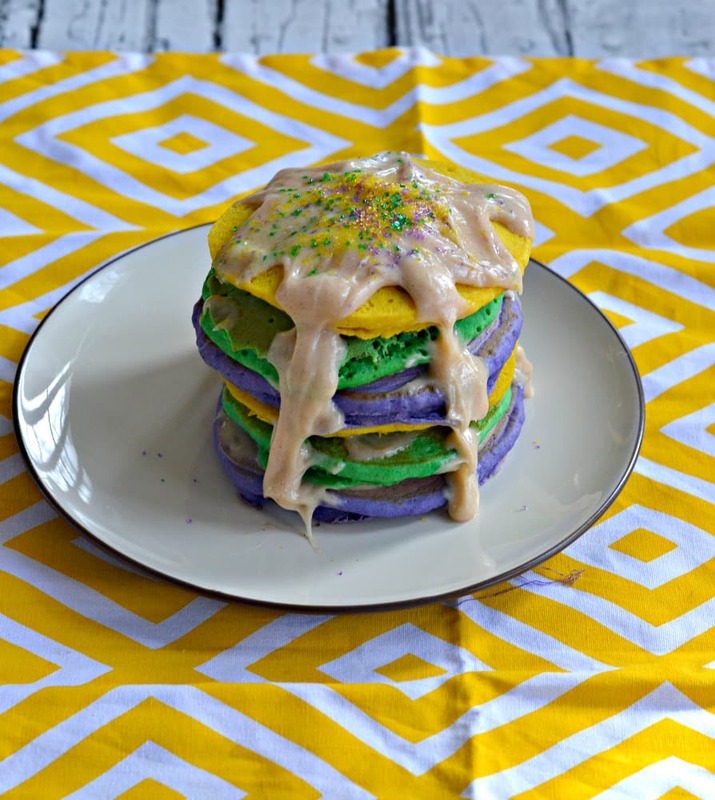 These fun yellow, green, and purple pancakes with a Cinnamon Cream Cheese Drizzle are a fun way to celebrate Mardi Gras and National Pancake Day! To make the pancakes combine the pancake mix, water, vanilla, and cinnamon in a bowl. Whisk until mostly smooth. Divide the pancakes into three bowls. Color one yellow, one green, and one purple. Heat a T-fal Non-stick skillet over medium heat. Spray lightly with cooking spray. Using the yellow batter, pour out 2 pancakes. Cook for 2 minutes on one side and then 1 minute on the other. 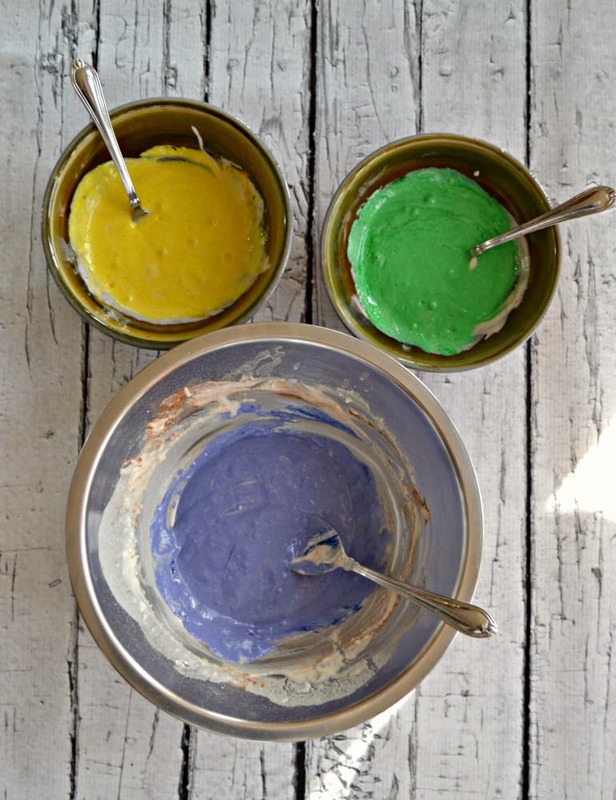 Remove from pan and repeat with the green and purple batter. Once your pancakes are done make the drizzle by combining the cream cheese, powdered sugar, vanilla, and cinnamon in a large bowl. Beat with a hand mixture until smooth. Add in the milk and stir. 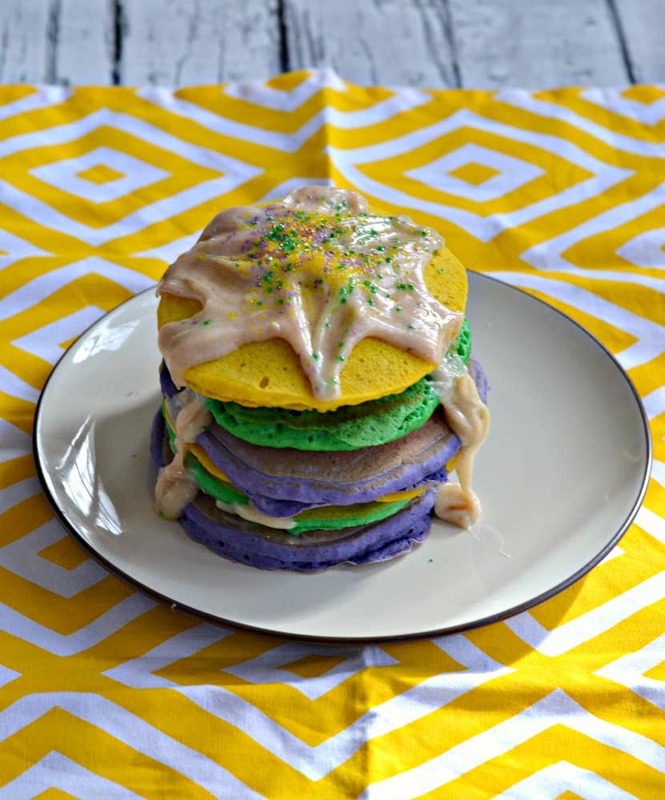 To make the King Cake Pancakes place a purple pancake on a plate and spread with 1 teaspoon of the drizzle. Top with a green pancake and another teaspoon of drizzle. Then top off with a yellow pancake and a teaspoon of the drizzle. Repeat one more time. Pour the remaining drizzle over top of the pancake tower and sprinkle with yellow, green, and purple sprinkles. Share with your favorite friend or family member. 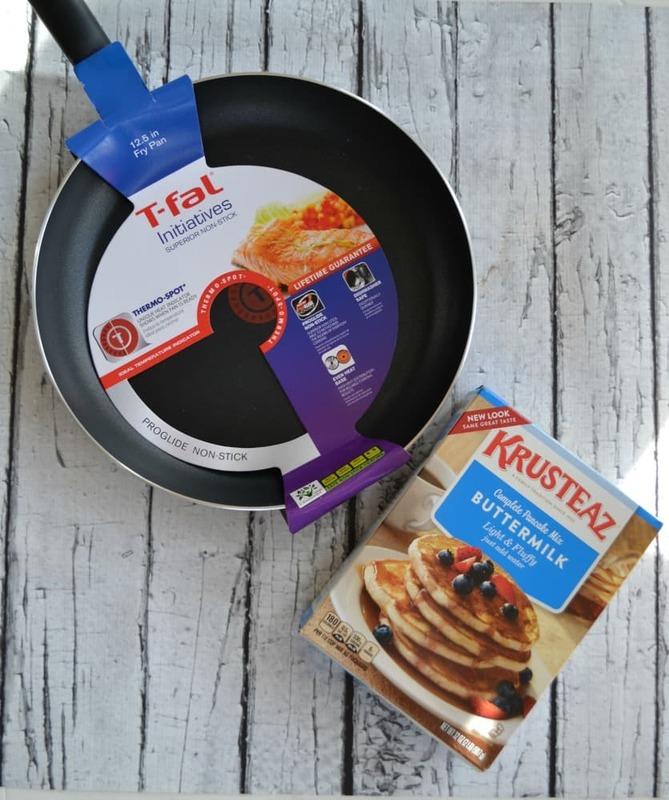 I received products from T-fal and Krusteaz in order to celebrate National Pancake Day. All opinions are 100% my own. These look absolutely delicious, loving how colorful they are!